My father, mother and 16 year-old brother were executed by firing squad on 27 September 1981. My elder brother was also slain the same year at the age of 27. My sister Maryam was also slain by the regime. My parents, Morteza Shafaei and Efat Khalifeh Soltani were slain when I was young, I was left with only my youngest brother who I reunited with years later. 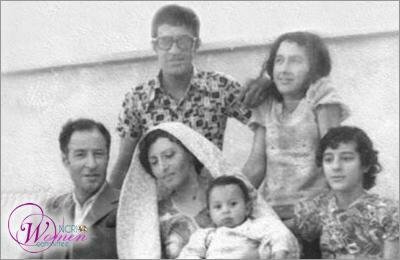 Martyred PMOI member Efat Khalifeh Soltani was born in Esfahan in 1939. This brave and cognizant woman never impeded the political and social activities of her children; rather, she always encouraged them to go on with their activities. In 1980 she became familiar with political issues and the resistance through her son Javad and her daughter Maryam, she then began reading political and religious books, becoming a partner to her children in the political activities. These mothers insisted so much and put such pressure that Tahery’s Office chair said on his behalf:“His honor says I don’t know these ladies”. But mother Shafaei said in a loud voice: “Don’t they know the families of PMOI members in Esfahan? Then who do they know? Tell him my name and remind him that until a year ago that you still had not come to power you were proud of knowing our family. The days our sons were clashing with Shahs army in the streets, out of fear of Major General Naji, for two weeks, you were taking refuge and trembling in our home. How is it that you are so forgetful and now you don’t know us anymore?” Tahery who was reeling headlong from the revelations by this mother, immediately accepted to see them. Shafaei and other mothers speaking to Tahery continuously and factually revealed the crimes and suppressive activities of the revolutionary guards as well as Hezbollah members in streets, university and schools. Mullah Tahery didn’t dare speak while these revelations were being made. Efat Khalifeh Soltani was arrested several times during her activities and while making disclosures. Once, when she and a number of mothers of the prisoners were staging a protest in front of Esfahan prison, she was arrested and was kept incommunicado for ten days. Efat Khalifeh Soltani, together with 40 other female university and high school students who had been arrested in the demonstrations were transferred to a prison in the basement of a building that belonged to the revolutionary guards in Najafabad. Despite the difficult conditions and the pressures in that prison, she raised the spirit of everyone by repeating the verses from the Quran and Nahjolbalagheh that she knew by heart to help her fellow captives endure the harsh conditions. The regime’s elements were mad that others in that prison called her mother and ordered everyone to stop calling her that. I don’t know exactly how many days it was after my father was arrested. I was sleeping in the house when I woke up to my mother screaming at revolutionary guards. I suddenly saw a revolutionary guards inside my room. My mother and I were alone in the house. My mother was screaming at the guards and she was very distressed. My mother said they want to take her with them. I asked when will you return. As she was screaming at revolutionary guards, she said to me: Just like they took everyone and no one ever returned, I will also not return. I don’t remember anything else she told me. I cried and screamed and attacked the revolutionary guard who was standing in front of the rest of them. I still remember his face as he laughed at me and threw me to the corner of the room. A few revolutionary guards came closer and grabbed my mother’s hands and threw us out of the house. When they threw her inside the police car, she told my neighbors to look after me. I only saw my mother one time after this incident. An aunt and uncle who were strong supporters of the Iranian regime and were known in Esfahan for their sympathy to the regime took me to the revolutionary guards headquarters on Kamal Esmail street. They brought my mother. I don’t remember exactly what was happening, all I remember is that she was put under a lot of pressure. They cursed her but she answered them back. She stood and never gave in to them. I had a weird feeling that I would never see her again and I felt a deep sorrow inside me but every time I remember those days I feel that she was a very strong and courageous woman and I am always proud of her. A lot of people have told me stories about my mother. I don’t remember much but what I remember is that she was very kind and very calm. She didn’t only treat us like her children but loved everyone the same way.